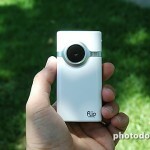 The Flip Mino video camera (www.theflip.com) could be the perfect complement to your digital still camera. I received a review copy of the Flip Mino this morning (sorry, no giveaway—it’s going back to Pure Digital soon) and within minutes I was making videos. See gallery and sample video at the end of this review. 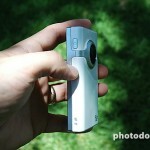 Just about every consumer digital still camera I can think of has the ability to capture videos. And videos from the Mino aren’t going to wow you with their quality. What sets the Mino apart (I think it’s pronounced “minnow”) are it’s ease of use, size, and that it can capture up to 60 minutes of television quality video (640×480 @ 30 frames/second) onto a 2GB internal memory. 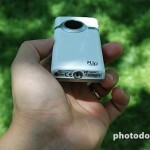 It is a device laser-focused on doing one thing and doing it well: creating video for viewing on the internet. Think YouTube and mailing videos to grandma. My Nikon D70 has no video capability at all and our Canon Elph, while respectable in the video arena, doesn’t have the juice to record a lot of video on a single charge. Plus, since video shares space with stills on the same memory card, total capacity is limited. 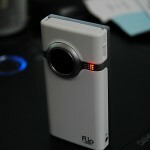 The Flip solves that problem by providing a separate device dedicated to video. 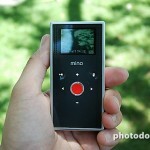 The Mino is extremely compact and lightweight and easily slips into a shirt pocket. It can be operated one-handed but felt slightly awkward—although, that could easily be because I have large hands and/or because I’m not accustomed to the device. My wife didn’t think it was awkward at all. It has seven buttons on the back arranged in a logical pattern beneath a smallish but workable screen. Play/Pause, Delete, Record, Back, Forward, Up, and Down. The up/down buttons are for changing playback volume or zooming. Left/right are for scrolling through videos you’ve already captured. The buttons are very sensitive and require no pressure at all to activate which took some getting used to. The record button is large with a good feel. I had no trouble finding it by touch and a red LED on the front lights up when recording—perfect for those YouTube confession-style videos. I took the Flip out to the park with my kids to test it. 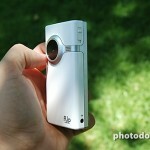 The video quality was decent although nowhere as good as my Panasonic DV camera (which cost 3x as much). Color was accurate enough in good lighting conditions but not vibrant. Because the Mino uses MPEG4 compression (at about a 4Mbps bitrate), artifacts are visible in the video during quick motion. But on a standard television set you wouldn’t notice and YouTube will do much worse things to the video quality. The fixed-focus lens covers a focal length approximately equivalent to a 50mm lens on a 35mm camera. 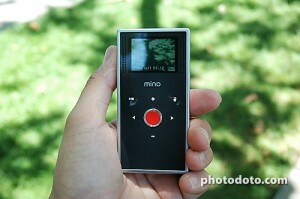 The Mino does have a 2x digital zoom but I’d avoid it. Zoomed video looks terrible and anyway 2x doesn’t really get you a lot closer. Don’t plan on zooming into the on-field or on-stage action with one of these. The audio (44.1kHz mono) was surprisingly good. Sounds were crisp and clear and covered a good range from normal speech to high-pitched whistles. I was able to record 60 minutes of video, as advertised, with enough charge left over to review videos on the device or play them back on a television with the included RCA audio/video cable. The device appears like a removable hard drive to your computer. 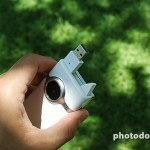 Plug it into a USB port (also used for charging) and you can drag videos onto your desktop—no software required. A couple of minor gripes: the Mino’s lens is protected by a clear glass/plastic membrane but I’d have still liked to see an automatic lens cover to prevent scratches. The namesake flip-out USB port works well but feels flimsy—if anything breaks on your Mino it will be this. I think the Mino is a solid device. It does one thing and does it well. For the price ($179.99 MSRP) it provides a good value. 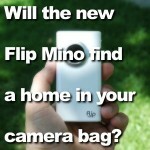 I can see many people using a Flip Mino to augment the capabilities of their still camera. DSLR owners might find the Mino especially handy since most DSLRs lack video capability altogether (imagine documenting a photo shoot or a lighting setup).